I arrive shortly after nine o’clock in the evening in Nice by ferry. In the city, there is a huge hustle and bustle: Friday evening, the streets are crowded, the cafés crowded, all parking lots occupied and people stroll along the beach promenade. But I get on my motorcycle, ride for about an hour and can finally take the D7 shortly after Cannes. The night dawned and after a near-crash with a wild boar group I knew it was time for the night’s rest. At Mont Vinaigre, the vinegar mountain, I find a small meadow aside the road. I’m too tired to set up my tent, so I just blow up the sleeping mat, roll out the sleeping bag and say “good night”! 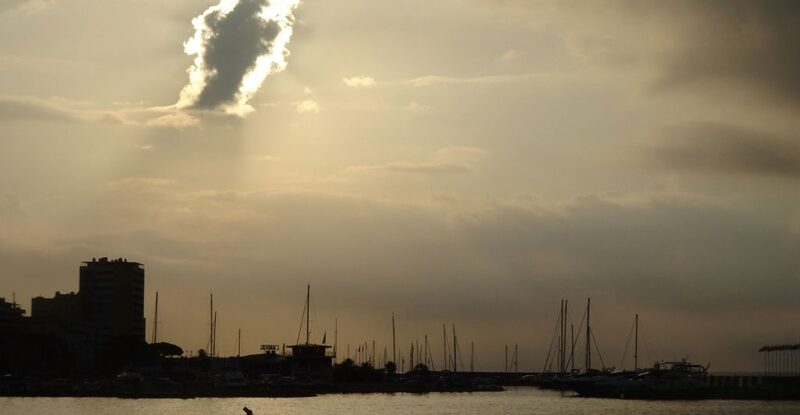 At sunrise I pack up, drive off and reach the outer quarters of Fréjus after a short time. I continue to follow the coast and enjoy the view of the sea shimmering in the morning light. At the Golfe de Saint Tropez I reach Saint Maxime and find a bakery to get some coffee and some pastries. At Port Grimaud I leave the coast and drive up to the village. From afar I see the ruins of the old church of Grimaud. 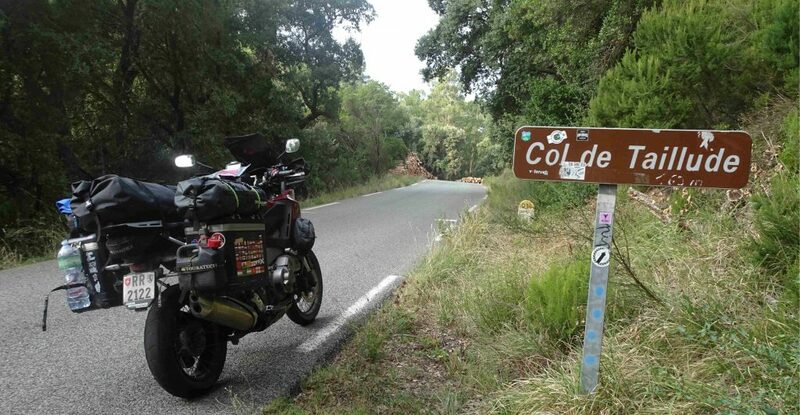 Right at the corner of the narrow lane I turn onto the D14 and follow the road to Collobrières. It follows the Col de Taillude, a small pass, and hardly again in the valley, I turn to the next pass. No villages, hardly any houses and little traffic. The narrow road is winding in some curves through the sparse forest. In Vidauban I find the first signpost to the Grand Canyon du Verdon. Slowly but steadily I gain altitude until I see the Lac de Ste Croix with its heart-shaped island near Aiguines. 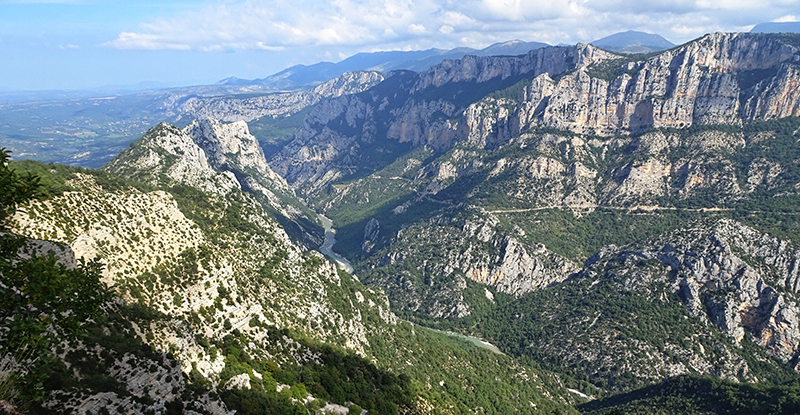 After a short drive I reach the next serpentines that lead me to the Verdon gorge. The gorge is 21 kilometers long, up to 700 meters deep and on both sides there are scenic roads. I follow the left bank and frequently stop to admire the views. The winding road, that leads me through rough tunnels and past steep walls, is really an eye-catcher. My way leads me through the medieval town of Trigance, which lies in the shadow of a mighty castle that can be seen from afar. I take the road to Castellane, which is accompanied by a stream shortly before the entrance of the town. The street cafés in the stopover town are well frequented by tourists and motorcyclists. I also take a short break in the village, admire the view of the church high above the town and then follow the Verdun into the mountains. In Val d’Allos, the road meanders along a bright green reservoir, followed by some small villages. In Colmars I find a camping site for the night and finish my day stage. After I have packed my things, I look for a bakery and find one on the outskirts of the town. The whole village looks like a museum. Behind the thick walls and the city gates there are rustic restaurants, craftsmen’s shops, an old church and small town houses in narrow lanes, accommodating many small shops with specialities and souvenirs. There is nothing modern – no neon signs, no parking spaces, no rubbish bins, everything is arranged in the traditional style. First I drive up to the Col d’Allos (2247 m.a.s.l.). After some hairpin bends I am high above the local ski resort with its many hotels, restaurants and holiday apartments. It is early in the morning so I have the pass summit all to myself. The narrow road on the north side nestles against the slope, some serpentines lead downhill in big turns. 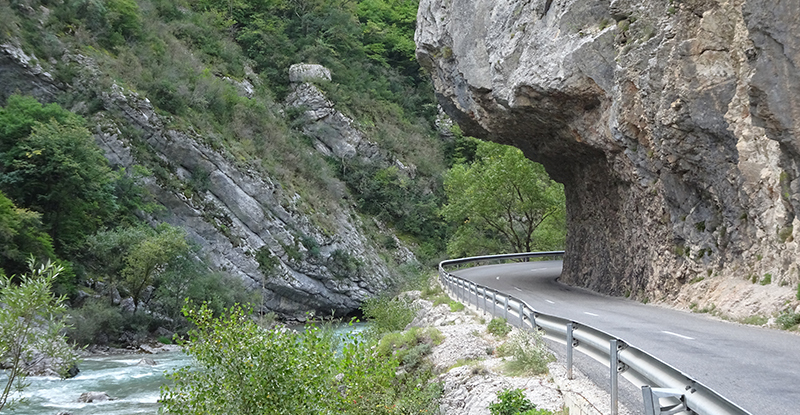 High above the river Le Bachelard, the road is embedded in the rock and every curve offers a breathtaking view of the river at the bottom of the valley. Two or three times I switch sides and follow the D902 to the Col de la Cayolle (2326 m.a.s.l.). On the south side of the valley after a few hairpin bends I reach a swampy plain. Here, the river Var, which gives the department its name, springs up and flows into the Mediterranean Sea in Nice. I follow the river downhill and admire the wide gravel bed that it has already formed after a few kilometers. Next come the first villages and then the river disappears in the Gorge de Daluis. The road runs high above the rushing water through mostly single-lane tunnels that are roughly cut into the rock. After a few kilometers, the valley widens again and the stream takes the whole bottom of the valley and winds itself in its stony bed. After a short drive I arrive in Entremont. At the city gate there are guards, dressed in authentic style, armed and helmeted. The parking lot in front of the city is packed with motorcyclists. After a short break I set off for the next highlight, the Gorge des Cians. Similar to the last canyon, the creek is deeply buried in red rocks and the road leads up along overhanging rocks and tunnels. At the end of the creek the roofs of Beuil shine in the sun. 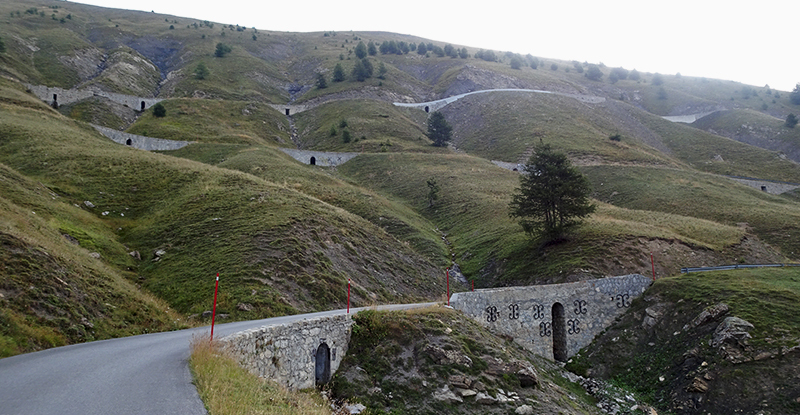 In the old town, the pass roads separate to the Col de Valberg and the Col de la Couillole. I turn to the west and drive over the Couillole. In St. Savoeur sur Tinée I turn left for the highlight of the day. 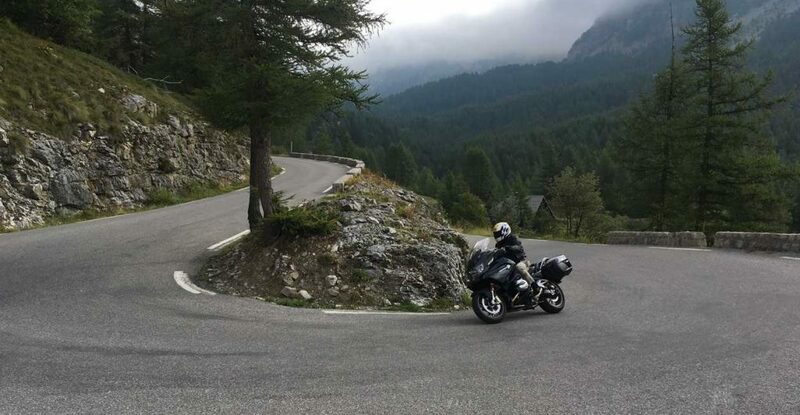 I constantly gain altitude but only now does the big climb begin and after numerous curves and serpentines I reach the alpine pastures below the pass. I turn around to the Cime de la Bonnette and take the obligatory photo of the milestone at 2802 m.a.s.l., admire the view and observe two capricorns that are hardly disturbed by the traffic. Passing sheep and marmots the road leads me to Jausiers in wide hairpin bends. In the valley I turn to the right and find a camping site below the mighty ‘Fort de Tournoux’ in la Condamine-Châtelard. WHO RIDES THE WORLD: MEET GINA LA MARINE! WHO RIDES THE WORLD: The Breakfast Club at the Women Riders World Relay 2019! WHO RIDES THE WORLD. SUPPORT FEMALE RIDERS WITH US!